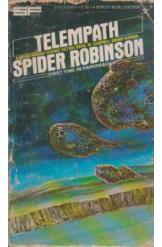 Telempath by Spider Robinson, Sci Fi. Isham Stone returns to the ruins of New York, determined to kill his own father. The alien muskys seek for the mysterious "Telempath." A sequel to the award winning novel "By Any Other Name."